The Raptor Center's veterinary resident from Spain, Dr. Irene Bueno, would like to share a webcam with our friends. A female Andean Condor was recently hatched at the zoo in Quito, Ecuador. Here is the camera link. 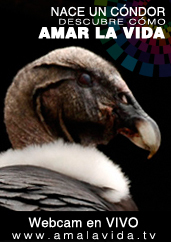 There Peregrine Fund's website lists an Andean Condor with a body length of 43-51 inches, and an 11-foot wingspan. Females weigh 17-24 pounds and males weigh 24-33. These condors nest in caves or on ledges on a cliff face. They lay a single egg that is incubated for about 59 days. The young birds learn to fly around 6 months of age, but stay with the parents for several more months. Condors may only breed every other year because of the extended breeding season. Young birds become sexually mature at 6 or more years of age.